Why do a 2014 roundup? Well, for one, it’s easy and the Accidental Locavore finds it interesting to see which posts were the most popular. This year the top 5 were all recipes — covering a large swath of cuisines. See what you think, and maybe by the time you’ve commented on them, I’ll have had the issue with the comments (not posting to anyone but me) fixed. 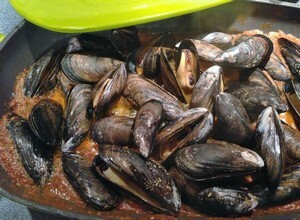 Jamie Oliver’s Moroccan Mussels: This is a super-easy and delicious way to make mussels. Add some crusty bread and a couple of glasses of wine and you’ve got a delicious dinner! David Lebovitz’s Salted Olive Crisps: From his fabulous book My Paris Kitchen, these make a great platform for almost any cheese. I think you have to eat them all, as the ones I tossed in a Ziploc got soggy, but what an excuse, n’est pas? 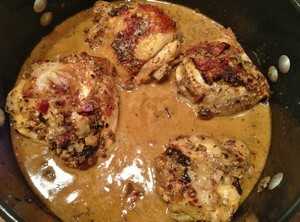 Chicken With Mustard and Bacon: Also from My Paris Kitchen, this is a mustard lover’s chicken! Make sure you have plenty on hand, as this has almost a whole cup of mustard (and a dollop of crème fraîche for richness). Great with pasta or potatoes as a side. Beef jerky: OK, as one of my friends let me know on Facebook, this isn’t the prettiest dish, but if you’re into beef jerky, know that it’s easily made (and more easily eaten). Ottolenghi’s Cauliflower Cake: As silly as it may sound, this is easily the cutest thing I cooked in 2014! 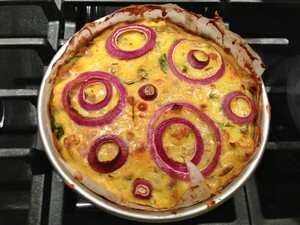 With its polka dots of red onion, here’s a dish that tastes as good as it looks. And, coming from the other hot cookbook of 2014, Ottolenghi’s Plenty More, it has a great pedigree (thanks again to Bob for my signed copy!). Cooking Sous-Vide: Thanks to my friend Zhu Zhu, I got to play with my very own Sansaire sous-vide machine. 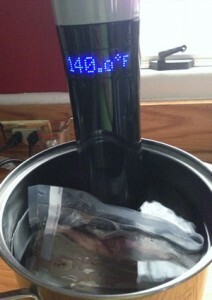 It turns out to be a very useful gadget, essentially a 21st century version of a slow-cooker. So far, my favorite use for it is to make duck confit, but I’m still experimenting. Skating and Songs: An avid figure skater, I was happy to write about a song my friends in the group October Project had used in a recent skating show that was broadcast during the holiday season. See how it all came about. Chicken Lady Chicken: Yes, another one from David Lebovitz (I told you it was a great cookbook) and the one I’ve cooked the most from this list. This one is a little spicy and I’ve made it as the recipe and also on the rotisserie-both great! Hudson Valley Distillers: Two friends, Chris and Tom, making some tasty spirits. I’m partial to their applejack, but other friends swear by the vodka. 2015 ushers in gin, whiskey and a café. 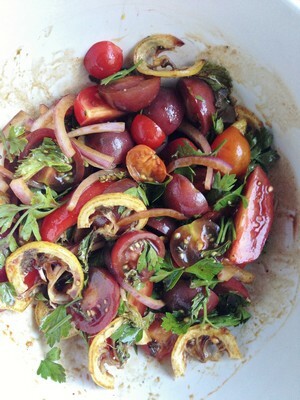 Ottolenghi’s Tomato Salad: If you’re stuck in the colder parts of the country, you’ll have to bookmark this for next summer when the tomatoes are ripe. In the meantime, the roasted lemons from this will perk up any winter salads and the dressing with the pomegranate molasses is terrific!